The Alumni Sites Web Ring is an economical and fun way to bind together web sites that share the common bond of school alumni. 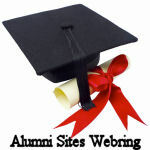 This includes websites with reunion planning, class websites and school alumni associations. Anyone is welcome to join that has a dedicated domain website. What this means is a website with a URL that you own for example this website is "www.weirdave.com". As a member of the ring you can expect hits on your site from all ages, intellects, and social classes. So if finding your classmates is a priority you must join this web ring!